So the dust has settled on Nokia's 'as late as possible in the working week' announcement at the end of October that the Next-Generation N-Gage Platform will be closed down in September 2010. The internet sites piled in with “I thought this was dead” and made the obligatory reference to sidetalking and including a picture of the original smartphone. Okay, we made the same digs as well, but then carried on. Most tech sites left it at a joke and moved on. And while the Nokia fanboys reared up their heads and complained in the comments, it illustrates one of the reasons why Next Gen N-Gage has failed. And the blame is, squarely, at the door of Nokia. The annoying thing is that, as the Next-Gen Platform launched, the technology was pretty much in place. It had an on-device client that was targeting the majority of handsets in the S60 portfolio; a built in application store before they became fashionable; not only their own development studios but third party support from THQ, EA and Gameloft; they had an addressable base that rivals any gaming platform... yet it slipped through their fingers. Be in no doubt that the N-Gage is a failure. And it's not a failure of ideas - it's a failure of implementation, support and addressing the needs of the consumer. And as Nokia's first foray into a software and service bites the dust, they'd better learn the lessons of N-Gage pretty quickly. I'll touch on this briefly, but Nokia were not starting from scratch. Thanks to the N-Gage handsets and games developed, they should have had an understanding of the market they were already in. I suspect the inability to get MMC cards in retail stores drove them to creating the online concept of sales and distribution; but what lessons had they really learned? Two things that never changed were vital. The first was that there was no change in the appreciation that the games market was wildly different to the handset manufacturing department, this never seemed to change the basic modus operandi of Nokia. Perhaps this was arrogance, but if they'd acted more like a Sony or Nintendo department rather than a Finnish handset manufacturer that would have made a difference. They were new to the table, and new companies need to play the game and follow the unspoken rules that already existed in the 'family' of gaming. Nokia didn't, and were shunned. And they kept the name N-Gage. Why? It already had a huge negative connotation, you'd never escape people going “is that the taco phone from three years ago?”, yet they carried on. A serious look at what people perceived of their games effort should have started with step one: rebrand the gaming service. The First True Device App Store? So lets look at what should have been the Cullinan Diamond in the Next-Gen Platform's crown jewels – the on-device Client. 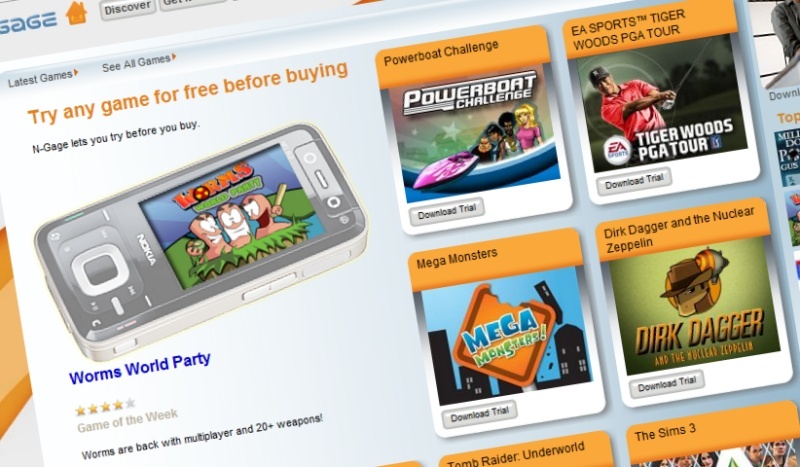 This is the portal into the world of N-Gage, where people would download the games, pay for them, chat to their friends, discover new products and keep everything up to date. It's a mix of IM client and app store, software updater and personal achievement record. And I'll give the designers credit here, when it launched, this was state of the art. Yes, it had problems that we all spotted straight away. What happens to your games when you need to switch phones, for example. Well, you license the game per handset, was the Finnish answer. Err... Again Nokia were thinking like a hardware manufacturer and not a publisher. Even after pressure (especially from us) this issue was never solved beyond negotiating on a per-case basis with the support lines. A solution that could never scale. And the client, while receiving bug fixes, never received any new features. A simple “suggest people you should befriend”, given the same games purchased and played, would have helped new users to the system find their way around to make the most of the multiplayer games and challenges that were out there. Nope, the first iteration was obviously enough for Nokia, and they moved on. Much as they do with handsets after one or two firmware updates. One of the goals of N-Gage was to create a community, and the two primary tools Nokia used for that were their N-Gage blog and the N-Gage Arena. Both of these were great starting points and if this start had been built on and outreach improved to other areas then there could have been a growing community around the platform. Much like the client, it seemed that blog plus forum was enough for Nokia. For example, when Twitter started to gain ground, did Nokia jump on this as a new tool for promotion and discussion? Or did they start an account, follow seven people, and post a massive three messages? I'll give you a clue, it's not the former. And if this isn't their official Twitter account, then why not? 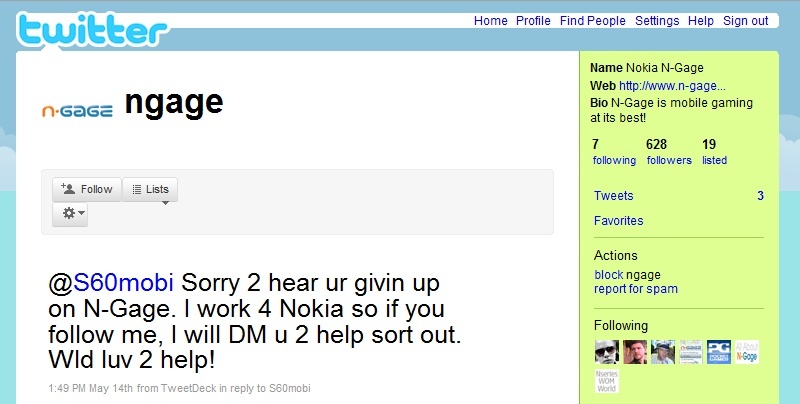 Nokia needed to get out and interact where the gamers were online. They needed to be doing everything better, faster and more prominently than the other companies because they were the young upstart left out in the cold to see if they would thrive or freeze to death. 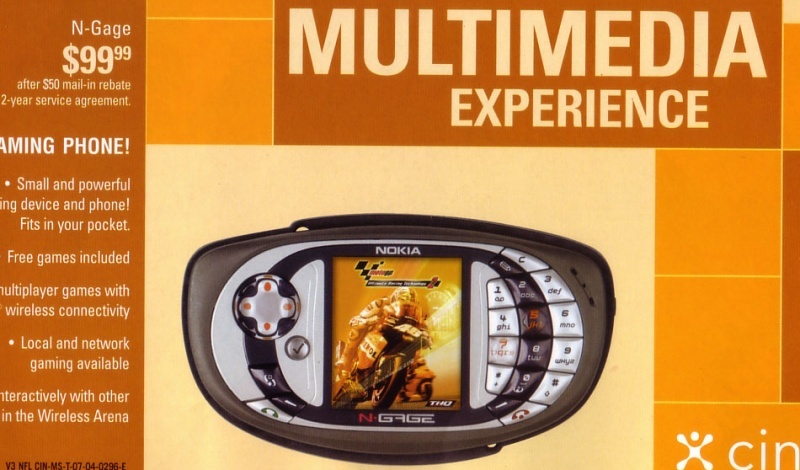 The fans running the N-Gage sites should have had a named contact, been pro-actively given registration codes for review purposes, early access to promotional materials and been courted to keep the community happy even if they didn't come to Nokia's N-Gage site. You may well be noticing a trend here. Okay, now this might be controversial, but the initial games for the Next-Gen Platform were pretty darn strong. Creatures of the Deep is still one of the best casual games out there, even though it's based on Fishing. But that's the point of a good game; no matter the topic, the development team should be able to make something that is entertaining. When Nokia had a strong hand on the developers, they managed this. Titles such as Creatures of the Deep, System Rush and One had a polished look and were suited for gaming on a mobile device. They even had their platform 'killer game' in the form of Reset Generation. Unfortunately, that was about it. You can't build an entire gaming ecosystem on your own titles in the modern market. You need the help of third party developers, and this is where the N-Gage catalogue was let down. The perception was that N-Gage games were nothing more than ports of the generic java games that these companies churn out for operator portals and dumb handsets. Sure they had a “do this and get N-Gage Points on the Arena” function, but that was it. There was no taking advantage of the extra power in the smartphones, or the opportunities for connected gaming. Countless game reviews could be boiled down to “it's the java version, look here.” And with every release, the view of the ecosystem in the eyes of the top tier developers slipped a little bit more, and they put less effort into the next title. Why? Well at a rather businesslike viewpoint, the games were not selling enough copies. When you can directly compare the sales of an N-Gage title to the java version on the same platform, when you can compare it to the whole marketplace, N-Gage just didn't match up when balancing the books. Nokia did not create a virtuous cycle for developers that would let them invest in game one, make money to live on and invest in game two, and repeat the process for subsequent games. It never happened. Partly that was down to simple sales, but also because the feeling was that the certification and approval process from Nokia was cumbersome and placed too much of a burden on developers. There were a handful of solid game developers on the Symbian platform, and a large number of Java studios that were well placed to take advantage of the end-to-end solution that Nokia apparently had. Where were they and why were they not involved? Either they were never approached by Nokia, or after making their own approaches, they looked at it and went... nope, not for us. Somewhere in the last two paragraphs is the reason that N-Gage mustered under 50 games while the iPhone App Store gathered thousands. Oh, and Reset Generation? In my review I closed with “Nokia, prove you can do this every time. Reset Generation is a superb hit single and we'll give you the Grammy for it. But let's have the album.” Well not only did we not get the album, but the one Rockstar programmer that Nokia had managed to capture, Scott Foe, walked away early this year. If you listened to my rant in this week's Insight Podcast, while I admittedly focussed on the initial hardware version of the N-Gage and how Nokia have handled the shutdown process, there is a common thread running through everything in the N-Gage project. It started off with something that was revolutionary or certainly ahead of the game. But the implementation was poor, there was a lack of continuing support and new ideas were rarely added into the mix. It's almost as if people were scared to innovate after the original Eureka moment. Here's the worrying question for Nokia. Is it just N-Gage that was plagued by this strategy? If we looked at the Ovi Store, would we find the same initial wonderful idea, an average first pass at implementation, and then see it simply pushed aside because it just about works, while the marketing department focusses on the next big project? Hasn't that already happened to Ovi Share (and Ovi Files - Ed) (and Ovi Sync - Rafe)? And what about the haphazard way that the one year anniversary and lapsing subscriptions to Comes With Music was handled? The N-Gage was a brave new world when announced in 2003. The revamp showed that, despite the poor implementation of the hardware solution, lessons had been learned. The question now is if any more lessons have been learned and if the Finnish company can apply those lessons to the rest of their Software and Services – the same services that they are proclaiming to be the future of Nokia.